You cannot listen to the pronunciation of meimei because your browser does not support the audio element. 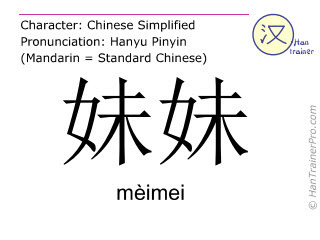 The traditional Chinese characters of mèimei are identical with the modern (simplified) characters displayed above. Zhe wei shi Anna, wo de meimei. Zhè wèi shì Ànnà, wŏ de mèimei. – English translation: This is Anna, my younger sister.